A little over a month ago, I was super excited about Copper River Salmon Season starting. It's a special season where prized salmon in the Copper River of Alaska are harvested. Salmon from this part of the world are extremely rich and amazingly delicious. It's distinguishable by the bright red color and fresh taste. I recently received a shipment of freshly caught Copper River Sockeye Salmon from my friends in Alaska (Thank you Beth!) and with it, I made this Spice Rubbed Salmon for dinner. 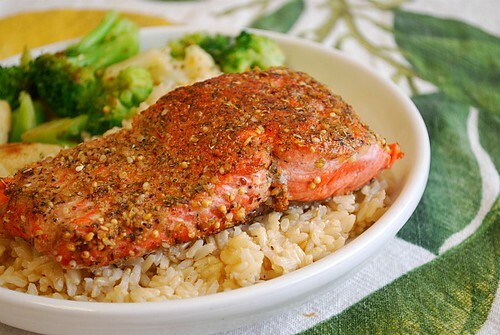 The pairing of freshly ground spices and rich salmon made it a wonderful summer dinner to enjoy the salmon season! For this simple spice rub, whole coriander seeds, cumin seeds, and fennel seeds are combined and ground in a spice grinder (or dedicated coffee grinder for only spices - not coffee! ) I left the mixture slightly course but feel free to grind as fine as you'd like. Brown sugar and salt is added to the mixture, rubbed onto the fresh salmon fillet and allowed to rest for an hour to allow the flavors to absorb into the fish. I pan seared the salmon and allowed it to finish in the oven. It was delicious and served atop a bed of garlic brown rice and seasoned broccoli and cauliflower. Heat a small fry pan over medium-high heat. Put the coriander, cumin and fennel seeds in the pan and toast, stirring constantly, until golden brown and fragrant, 2 to 3 minutes. Transfer the spices to a spice grinder and grind. Transfer to a small bowl and stir in the brown sugar and salt. This has become one of our family favorites! So good...thanks!